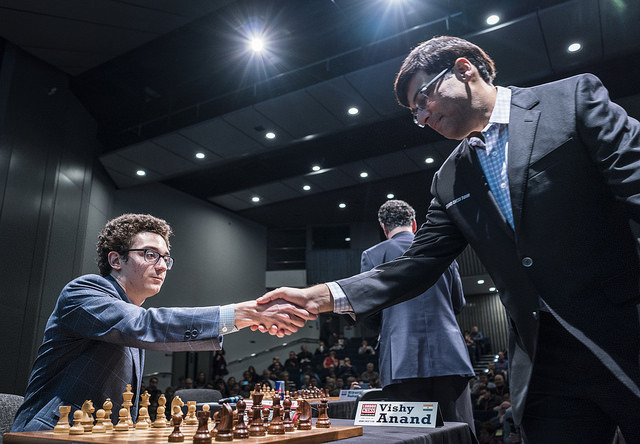 Fabiano Caruana broke the draw streak in London and has now started a new streak of his own after beating Vishy Anand to claim a second win in a row. That puts him a full point clear of the field, since none of the other players has managed a single win so far. 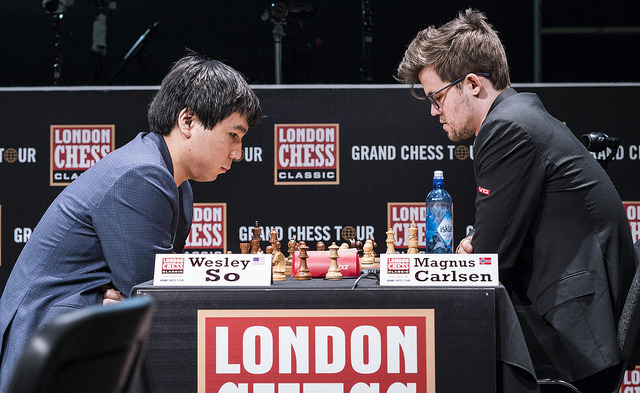 MVL’s attack suddenly ran out of steam against Levon Aronian, while Magnus Carlsen was frustrated by Wesley So in the longest game of the day. The players now have a rest day to rediscover their taste for blood! Probably you’ve got to take some risk, got to play uncompromising openings and got to create positions where both players have chances. I felt like I would lose at some point, but when I saw 25.Bc1 I suddenly started to get a bit more optimistic about my chances. I realised my position is bad, but at least I had a plan and that was really all I needed for some confidence in the position. When I saw this b3, c4 the position is double-edged and I have some chances. I completely lost the plot, because from move 29 or so every move is a blunder, or if not actually a blunder then from intent. I believe a loss will almost always, because of the shock effect, force you to question everything you’d kind of assumed for a while, and it makes you uncomfortable in a very good way. So losses are good, but they by no means get easier with experience. In fact, if anything, I’m much worse with losing now than before. Nowadays people say, “you seem like a very well-behaved loser”, but inside I’m dying! I’m just waiting to get into the room and hit my head against the wall or something. Given the draws all around him, meanwhile, Fabiano’s two-game winning streak looks almost as impressive as his magnificent seven in the 2014 Sinquefield Cup! 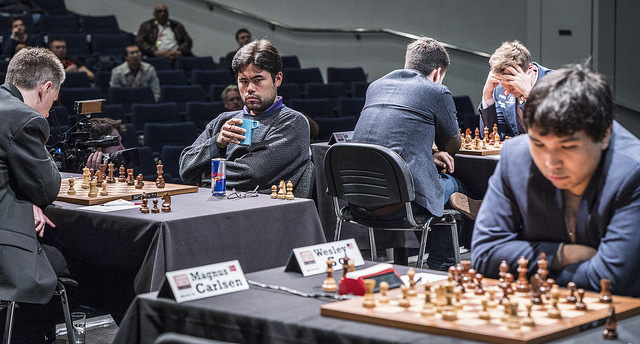 The other games went the way of all but two games at this year’s London Chess Classic, but perhaps only one was entirely without incident. After his loss the day before Sergey Karjakin was happy to get a very easy 30-move draw with Black against Ian Nepomniachtchi. Karjakin: Congratulations to the Russian women’s team on a brilliant victory! The men fought to the end but fell just short. Congratulations to Azerbaijan on a deserved victory! Nepomniachtchi: Can you teach me how to feel yourself a winner when you miss out on the Championship title? K: The moment you miss out on it, I’ll teach you. N: And do you support Russia in general? N: You skipped dinner? Strange. I watched the news and there wasn’t a word about it. K: Well firstly, keep your jealousy quiet, and secondly, rooting for someone hysterical is a thankless task, that I’ve already understood. N: Forgive me, Sergey! You’re cool. Anyway, that digression was in place of discussion of the game, where Ian’s preparation went out the window when Sergey surprised him with 5…exd5 in a 4.Qc2 Nimzo-Indian. On the last 10 occasions he’d played 5…Qxd5. Nepo therefore decided to avoid a theoretical discussion and set about instead exchanging pieces for a draw. 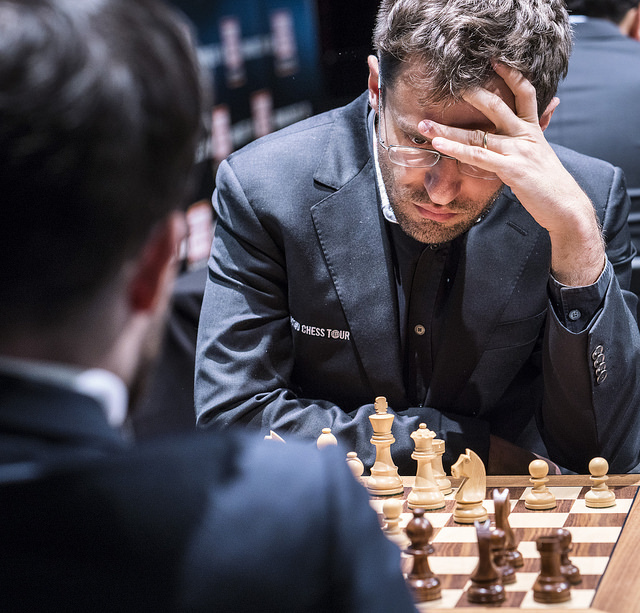 Aronian-MVL was drawn in just 25 moves, but was a very different game. Maxime ended up getting all the dynamic play a Grünfeld player dreams of after playing 14…f5!? I’m a bit upset. I came to play for a win and then I had to beg for a draw, basically. That of course is not the game plan which I had in mind. He did get the draw, though, since Maxime couldn’t find a clear-cut path to victory. 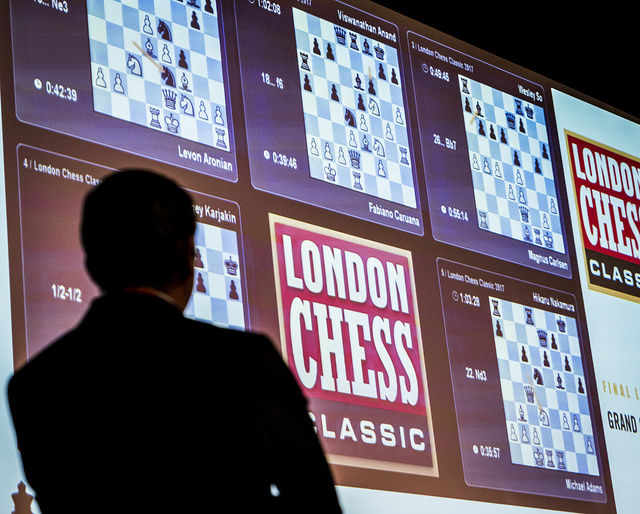 There were some on offer, but as both players noted, it would have been computer chess. For instance: 18…Qh4! 19.Bd4 Ne3! 20.Bxe3 Bh3!! First of all I think it was pretty equal until he allowed this 29.c5 and then I got a huge initiative… basically right before the time control I thought I was close to winning, but after the time control I realised it wasn’t so at all. Suddenly Wesley had a chance to force a draw, and after checking for 6 minutes he took it with 61…f2!. 62.Bxf2 Bxg4 would have been an instant draw, but 62.Re5+ did nothing to alter the outcome after 62…Kf7 63.Rf5+ Kg8 64.Bxf2 Bf1! 65.Kg3 Ra3+ and all the pieces were exchanged off. 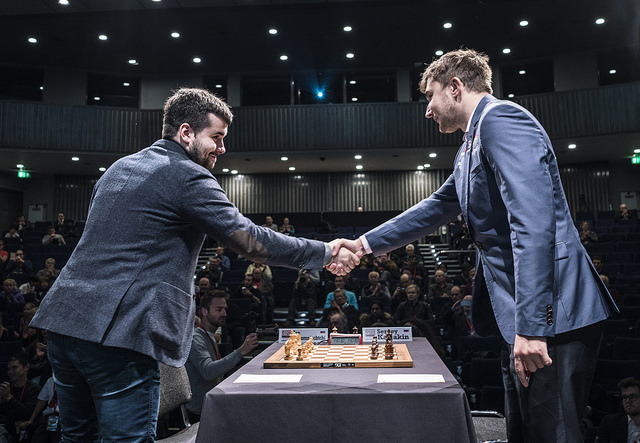 Maxime’s best chance to win the event will be if he can beat Caruana with White after the rest day, while Carlsen has Black against Nakamura in one of those match-ups that we all watch with added interest. 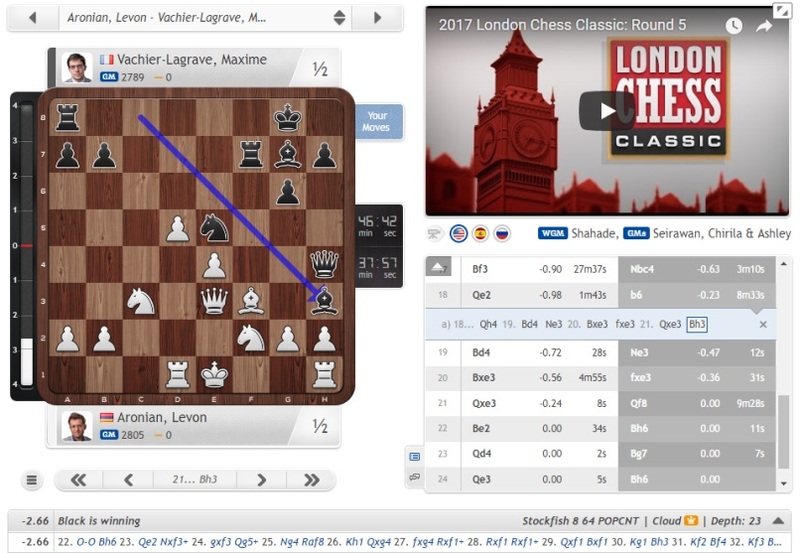 You can watch all the London Chess action here on chess24: London Chess Classic | British Knockout Championship | FIDE Open.